My family loved this dish... and we loved the sweetness of the sun-dried tomatoes and the great garlic flavor. 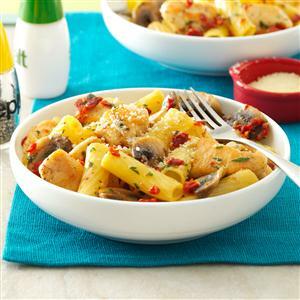 If you are gluten free - substitute gluten-free penne pasta and 1 tablespoon of cornstarch for the flour. Delicious! Cook rigatoni according to package directions. In a small bowl, combine tomatoes and boiling water; let stand 5 minutes. Drain; chop tomatoes. Sprinkle chicken with garlic salt; add flour and toss to coat. In a large skillet, heat 1 tablespoon oil over medium-high heat. Add chicken; cook and stir 4-5 minutes or until no longer pink. Remove from pan. In same skillet, heat remaining oil over medium-high heat. Add mushrooms and garlic; cook and stir until tender. Add broth, wine, parsley, seasonings and chopped tomatoes; bring to a boil. Stir in chicken; heat through. Drain rigatoni; add to chicken mixture. Sprinkle with cheese and toss to coat. Yield: 4 servings.